Do you want to stop people dead in their tracks with your shred guitar licks? There are many guitarists who can play ‘fast’, but there are VERY FEW who understand how to play licks that sound anything more than repetitive arpeggios or scales. Playing creative shred guitar licks that shoot fire is about much more than raw speed - it is about creatively using the notes of your licks to build intensity and force others to drop everything and pay attention. Discover the innovative and super simple process for transforming ANY guitar lick into a totally ‘killer’ shred guitar lick. Find out the secret to making your guitar licks stand out in any musical situation, so that your guitar playing is always the main focus of the music. Learn why countless guitar players lack the creativity to play truly great shred guitar licks (even though they CAN play fast)... and what you need to do to play powerful and creative shred guitar licks. Learn simple but powerful tricks to improve any guitar lick. 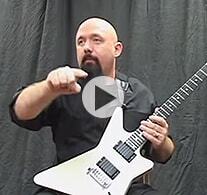 Get INSTANT FREE access to this shred guitar video. Simply enter your name and email, then click the "Show Me The Video" button to enter. All of your information is always kept 100% private and confidential.